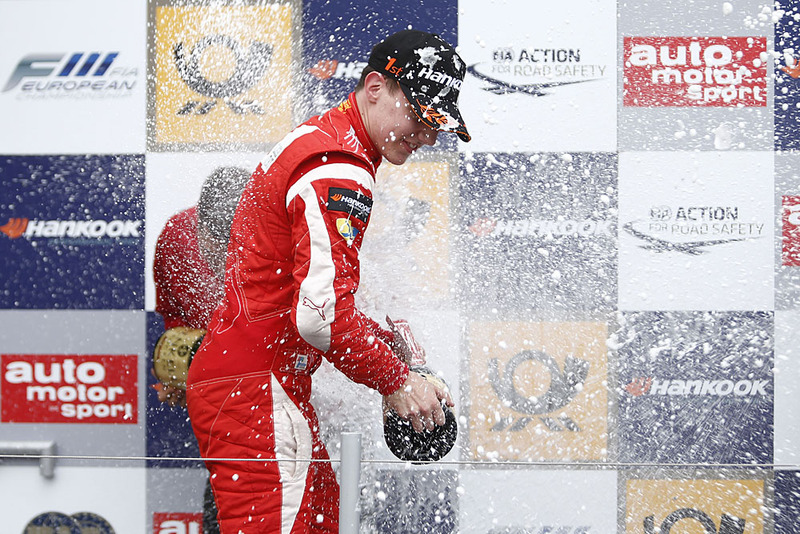 Another win for Marciello. © FIA. Raffaele Marciello romped to his seventh FIA European Formula 3 victory of the season, in a commanding display that saw him first hold off Alex Lynn and then later Lucas Auer. After a solid start, the Prema Powerteam racer pulled alongside Lynn off the line, holding his line around the outside of Paddock Hill Bend, before solidifying the move in Druids. From there, Marciello maintained a small gap up, with Lynn refusing to give up on the victory. It all came to naught for Lynn on lap 15, when the Essex racer spun exiting Paddock Hill, spinning to a stop and stalling halfway up the short chute to Druids. Much of the pack dodged the stranded Prema car – all that is, except Lynn’s teammate Eddie Cheever III, who clipped the rear of Lynn, forcing both into retirement and forcing a safety car call. There was another 4.5s gap to 6th place man Tom Blomqvist, while Lucas Wolf took a confidence boosting 7th for URD Rennsport. Nicholas Latifi came home 8th, ahead of Roy Nissany (scoring his first points) and Antonio Giovinazzi, the latter of whom grabbed 10th despite stalling at the start. There was chaotic period following the safety car when Josh Hill, Felix Serralles, Daniil Kvyat, Spike Goddard, Mitch Gilbert, Will Buller, Sean Gelael, Michele Cerruti, and Jordan King all picked up drive through penalties for setting their fastest sectors in a caution zone. Following his suspension, Mans Grenhagen returned to action today, only to go off by himself at Druids on lap six.